After much success with our RAGE Rescue program, we have decided to continue helping local pups find homes by featuring more dogs from DFW Rescue Me. We'll call this blog item "Canine Corner'' and we'll post an available dog each week. I present to you our first guest of honor ... Kate! Kate was found pregnant, roaming the streets of Dallas, with a tummy so large it dragged on the ground. She was taken by a DFW Rescue Me volunteer to a local vet, and the next night she delivered nine healthy puppies! Her puppies have found great homes, and we are hoping Kate can find one too. She's a smart dog, and she knows simple commands. She's also potty-trained. Kate is very affectionate, and she loves to have her ears and belly rubbed. She's a happy dog who wags a lot, and she gets along with other dogs and even cats! She knows her life was saved so she's very appreciative. She'll make a great companion. 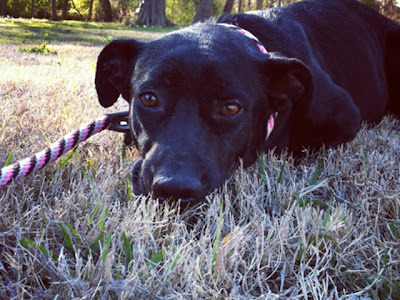 Kate is a Black Lab/Basset Hound mix. She weighs about 50 pounds, and she's now spayed. For more information on sweet Kate, please click here. Awesome work in helping our four legged friends. Thanks for doing this each week. Hopefully they will make some people very happy! Thanks! I hope so. We had about an 80% success rate with it on RAGE so I'm hoping between this site and mine (sybilsummers.com), we'll be able to carry on pairing up good people with good pets. Dogs rule. She looks like a sweetie.